The larvae of the leaf-feeding weevil Oxyops vitiosa, a biological control agent of Melaleuca quinquenervia, are covered with a viscous orange coating that is thought to protect against generalist predators. This coating is gradually lost as the larvae drop to the ground and pupate in subterranean pupal cells. To test the antipredator activity of this species, four immature life stages (early instars, late instars, prepupae, pupae) were exposed to a common generalist predator, the red imported fire ant Solenopsis invicta. Choice tests were conducted by placing an O. vitiosa individual and a control larva of the weevil Neochetina eichhorniae into an arena containing a S. invicta colony and observing subsequent ant behaviors. 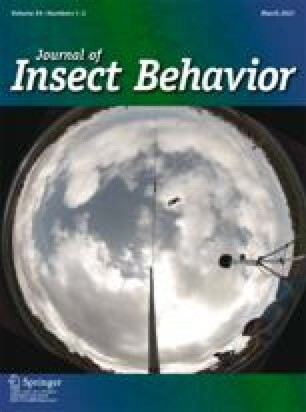 S. invicta workers contacted O. vitiosa early instars, late instars, and prepupae less frequently than control N. eichhorniae larvae, and upon contact S. invicta was less likely to behave aggressively toward these O. vitiosa life stages than toward N. eichhorniae larvae. However, S. invicta contacted, attacked, and consumed naked (nonencased) O. vitiosa pupae and N. eichhorniae larvae with equal frequency. Encased O. vitiosa pupae buried in sand were not attacked compared to susceptible encased pupae on the sand surface. By shifting from a chemical defense during the larval stages to a physical defense during the pupal stage, O. vitiosa reduces the risk of attack by this generalist predator.